My first ever interstate adventure was a road trip with my best friend and her family; destination, Sydney. We stayed in a first floor flat in an ugly brown brick house in Bondi, just a few blocks’ walk from the famous beach, where it was still de rigueur to be sprayed with mutton bird oil and put yourself out to fry. Since the trip spanned both Christmas day and New Year’s Eve, we needed suitable venues to celebrate. Back then, posh hotels were the obvious choice. 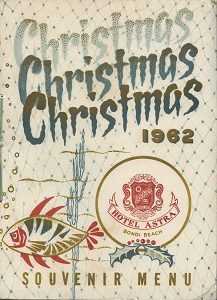 Hence, on Christmas Day 1962, we found ourselves at the Hotel Astra, Bondi Beach where, according to the souvenir menu, Allan, Cecil and Stan Oldfield and Staff hoped that we heartily enjoyed our Christmas and that the New Year would bring “Health, Happiness and Prosperity” with a capital H, H and P.
Tastefully adorned with nautically themed illustrations, the multi-course celebration menus offered such choices as Oysters Natural au Citron, Consommé Royale, Fillet of Sole Bonne Femme and Roast Muscovy Duckling à l’Orange. 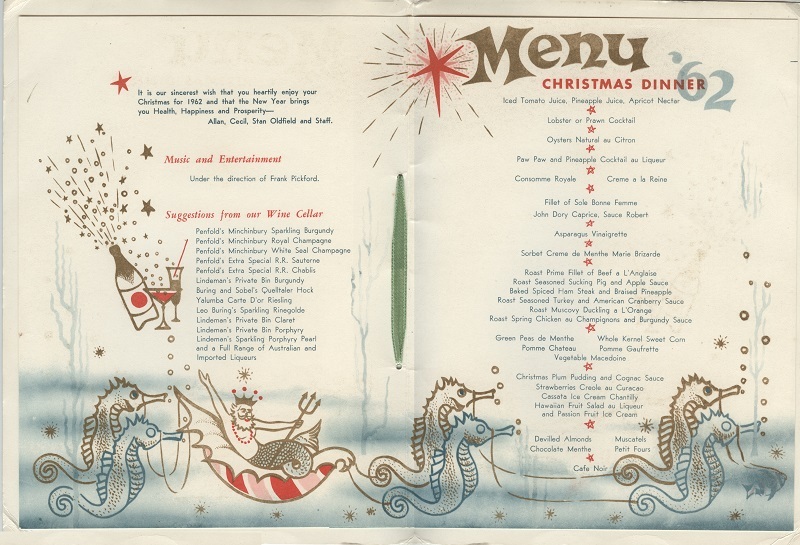 Of course, if you were a real Aussie and a bit thrown by all the French, you could opt for Prawn Cocktail, Baked Spiced Ham Steak and Braised Pineapple and good old Plum Pud to conclude. “Suggestions from our Wine Cellar” included those popular fizzes Porphyry Pearl and Sparkling Rhinegold, and wines from several Australian makers who described their product generically as Chablis, Hock, Burgundy or Claret. 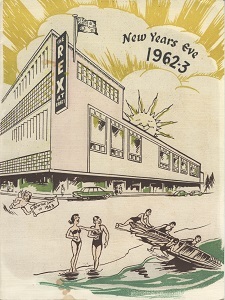 New Year’s Eve at the Rex Hotel, hosted by Mr and Mrs Vic Bazzana and Staff, had more modest culinary aspirations. Oysters Naturelle or Fruit Cocktail were followed by the ubiquitous Sole Bonne Femme, half a Spring Roast Chicken with vegetables in season, Tropical Fruit Salad and Ice Cream, Assorted Cheese and Coffee. The Rex, later the Regis and now the Beach Road Hotel, is still going strong. As the Regis it was a popular music venue, remembered by some for “IXS on a Saturday arvo for $5”. And it’s still a popular party pub. The menu has changed a bit. Now it’s pizzas, sliders, steaks and the distinctive Chicken “Pizzagiana”, a unique creation where “our famous parmigiana meets a supreme pizza, pepperoni, mushroom, bacon, olives and tomato sauce topped with grilled mozzarella cheese”. The mind boggles. Alas, the Astra has fared less well and after some dark years as the alleged haunt of drug dealers and other dangerous types, was converted into apartments. “Altered unsympathetically” snorts the heritage register. Most of Melbourne’s posh hotels of similar vintage have also disappeared, victims of an urge to erect “skyscrapers” that started with the 20-storey ICI House, completed in 1958. (Then the tallest building in Australia, this triumph of modern architecture continued to make headlines for some years, as pedestrians dodged panes of glass dropping at random from its windows.) Only the Hotel Windsor survives, thanks in part to a government bail-out that saved it from demolition in the ‘70s. Adapted from an excerpt from my book Me and My Big Mouth.